Imagine going out to your garden and harvesting a bowl of fresh greens for cooking, or for a crisp afternoon salad. Sounds fairly normal, right? But what if you could harvest your greens year after year without having to plant after the first time? Perennial greens can give you this reality—where your salads and cooking greens grow and produce without you having to do anything but harvest. Ahh, the bottomless salad bowl. 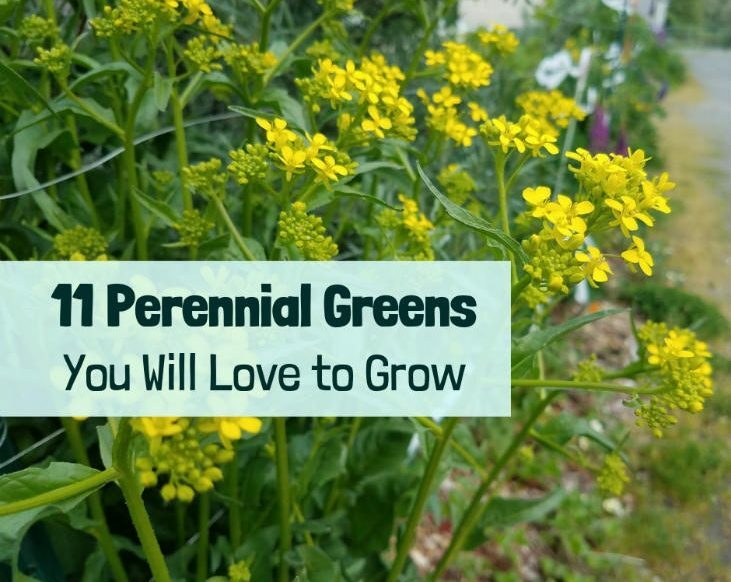 Perennial greens sound pretty amazing, right? But my guess is that you could use some help figuring out which perennial greens to grow, and which ones you would enjoy eating. Then keep reading, because this post covers 11 perennial greens that you can grow in your garden. They’re broken into two groups based on overall taste. I made sure to include at least one perennial green for each USDA Climate Zone ranging from 3 to 11 and most can grow across the continental United States. Perennial greens are the hardy winter warriors that survive the cold and live to fight another day, year after year. But of course, “winter” varies quite a bit from one place to the next. A perennial in southern California might be an annual in the Pacific Northwest. The USDA Climate Zone helps you match up your winter conditions with the what the plants need to survive, so you can see which greens will work for you. And don’t worry about taking notes—I’ve created a free and easy-to-print cheat-sheet with all the information you need to get started with these 11 perennial greens, plus some extra resources. What Are Perennial Greens and Why Should I Grow Them? Do you know what perennial greens are? At their most basic, perennial greens are vegetables that you can harvest to make salads or to cook with. Basically, you can use them just like traditional greens (lettuce, spinach, chard, kale, etc.). What’s awesome about perennial greens is that once you plant them, they come back year after year. That’s the definition of a perennial plant—they survive the winter and continue to yield abundance again and again. By replacing your traditional greens with perennial greens, you can skip the planting part of gardening and jump straight to the harvesting after the first year. If you’re still a bit confused about how perennial plants are different from annual or biennial plants, check out my blog post all about these 3 types of plants. And if you need a refresher or just want to learn more about perennial vegetables, then check out my blog post all about perennial vegetables. In addition to perennial greens you might also be interested in perennial root vegetables. If you want information on more perennial vegetables than I cover in this post, then the book Perennial Vegetables by Eric Toensmeier is a great option for you. This book covers over 100 perennial vegetables. Perennial greens like this Turkish rocket are a great addition to your garden. Some do have a strong flavor but are great once cooked and can replace traditional greens like mustard greens. Often perennial greens seem to fall within this category of flavor. I admit I tend to prefer milder salads, but if you like a bit more flavor and diversity in your salads then you will love these greens. These greens could also add some spice to a base of milder greens. Plus, they can be cooked as a veggie side or mixed in main course dishes like soups, pastas and curries. Yup, the trusty old dandelion that I’m sure you already have growing in your yard. You may not think of this as a food plant, but it is used both raw and cooked all over the world. It has a flavor that is similar to mustard greens. Even though you probably have dandelions in reckless abundance, you can actually buy dandelion seeds. (Yes, I know…) These dandelions have been cultivated for superior flavor (rather than being adapted for survival in the wild). The cultivated varieties will give you a much milder green. But even if you go for their wilder cousins, harvesting young leaves before the dandelion flowers will give you the mildest flavor. Learn more about dandelions and how to use them in your garden. Sunlight Requirement: Full sun to partial shade. Less bitter when grown in partial-sun. Plant Size at Maturity: 3 inches high when not flowering, 4 inches to a foot across. Note: While it may seem strange to buy dandelion seeds, the wild types tend to be more bitter. Lovage has a strong celery or parsley flavor and can be used in a similar manner. This plant does get very large, so it will be best placed on the edge of your garden. There, it can attract beneficial insects and provide a nice backdrop to your garden. Young leaves and stems can be harvested and used in cooking, but they may be too strong to eat raw. Learn more about lovage and how to use it in your garden. Note: Grows very tall making it good along the north side of the garden. Turkish rocket seems to be one of those love-it-or-hate-it type plants. Some people like it and others aren’t so thrilled by it. I think it’s not just personal preference but also the variations in plant genetics that drives the divide. Personally, I’ve found Turkish rocket to be tasty raw or cooked, but it does have a distinctive flavor that’s not for everyone. The young leaves have a milder flavor than the older and larger leaves (And in addition to the perennial greens, this plant produces a flowering stem that you can eat like broccoli!). Learn more about Turkish rocket and how to use it in your garden. Note: In some climates may become weedy due to large seed production. May be considered an invasive plant in some areas - check with your local conservation/soil district. Sylvetta arugula tastes very similar to regular arugula, but a bit stronger. If you like arugula, I would recommend trying this plant out. Perennial greens like this one that can easily replace a more traditional vegetable (arugula in this case) are some of the easiest to add to an existing vegetable garden. Learn more about Sylvetta arugula (Diplotaxis muralis and Diplotaxis tenuifolia) and how to use it in your garden. Note: Make sure when purchasing that the scientific name matches. There are a lot of plants called arugula making it easy to get the wrong type. Sorrel - Rumex spp. and Oxyria spp. Sorrel has a nice, tart lemony flavor and can be a very productive perennial green for your garden. There are several different types of sorrel that are all edible. This is another easy one to add to your garden. Learn more about how to add sorrel to your garden. Note: Fully edible but best if mixed with other plants and not eaten in large quantities. There are many mild perennial greens that are right at home in a salad. This salad includes several annuals but also miners lettuce which is a great perennial green. If you are looking for some mild perennial greens that could replace lettuce, spinach, or Swish chard, then this list will get you off to a great start. Many of these plants, like sweet potato, will provide you with other harvests than just the greens. And yes, I did mix in a tree and a shrub in this list! While that may seem odd for a garden, having trees and shrubs along the edges of your garden can help reduce your pest issues by supporting beneficial insects and birds. Plus, it is hard to run out of greens to harvest if they are coming from a tree or shrub! The leaves of scorzonera can be harvested and eaten just like lettuce, and can be eaten raw. This plant is very hardy, and in mild climates such as western Washington, it can be harvested as a winter green. Scorzonera makes for a great perennial green if only the leaves are harvested. This plant also has an edible root but harvesting the root will kill the plant. Learn more about how to add scorzonera to your garden. Note: Has a sweet and edible root but harvesting the root will kill the plant. These are amazing perennial greens that are related to plants like cabbage and broccoli. The leaves can be used just as you would use regular collards. Interestingly, the leaves are supposed to improve after the first light frost. That said, tree collards can be killed by temperatures around 20 degrees F, so light is the key word. Learn more about how to add purple tree collards to your garden. Note: Propagated by rooting cuttings of existing plants. The link for purchasing is the best source I was able to find. This is a rare but amazing plant. This is one of my favorite perennial greens. Miner’s lettuce is perennial down to zone 6, but it will likely self-seed in colder zones, which means you’d probably get the same benefit of the green that keeps on giving. With a very mild flavor, miner’s lettuce is great raw in salads or cooked as a spinach substitute. It also grows well under shade, making it a great perennial green for those shady areas. Learn more about how to grow miner's lettuce in your garden. Note: Great in a shade garden - old leaves can turn bitter especially in full sun. Will self-seed as an annual in colder climates or very hot climates. This shrub is fantastic if you like salty snacks. The leaves are edible and have a mild but salty flavor, making them a fun raw snack. Saltbush leaves can also be used in cooking to add a mild salty taste to foods. As a shrub, it’s best grown on the edges of your garden, where it will provide great harvests for you while also providing shelter for wildlife and beneficial critters. Learn more about saltbush and how to add it to your garden. Note: Do not fertilize with artificial fertilizers - the plant may concentrate toxic levels of nitrates in the leaves. Hard to find in the United States. The purchase link was the best I could find. Does not like wet climates. I’m sure you know that sweet potatoes produce an edible root crop, but did you know you can eat the leaves too? The leaves are edible, and they’re an important food source in other parts of the world. You can eat the leaves cooked, with a bit of the stems attached. But these greens should not be eaten raw. Learn about all the uses of sweet potatoes and how to add them to your garden. Note: Lots of different varieties - not all will be hardy down to zone 8. Linden / Lime Tree / Basswood - Tilia spp. Wait, you might be saying, you want me to grow a 40 ft tree as a perennial green? Yup! But luckily, you can keep it down to the size of a shrub by coppicing it. If done on a 2-year cycle, you can keep your linden tree down to around 6 ft and get a bountiful harvest of leaves. The leaves can be eaten raw, and they’re supposed to be great in salads or sandwiches. Learn about the linden tree and how to harvest it. Note: Several different species growing 40+ feet tall but can be coppiced down to 6 feet on a 2 year cycle. Tilia americana is found in North America. I love mixing flowers and perennial greens (and other perennial vegetables!) into my gardens along side my traditional vegetables. The result is a beautiful ecosystem that supports my family and I and nature through its amazing abundance. Just imagine having a vegetable garden with all—or even some—of these perennial greens mixed into your garden or growing nearby. Lovage, linden and saltbush could be planted along the northern part of your garden, where they could block those cool northern winds without shading out sunlight. Tree collards could be planted nearby, perhaps against your house or another structure in full sun where they wouldn’t add to the shade but they’d get some protection from the harshest cold. Miner’s lettuce could be added to the shady parts of your garden that would normally be unproductive. Then some (or all!) of the remaining perennial greens could be mixed in among your traditional vegetables. Sound nice? I think this type of garden would be an amazing place to hang out, harvest some tasty food, and observe all the interactions taking place between the birds, pollinators and other beneficial critters that are drawn to the sanctuary of perennial plants. Did I mention perennial greens (and other perennial vegetables!) are great for attracting beneficial critters? But the first step is to add just one of these perennial greens. So pick one from the list that sounds great to you, and add that one to your garden this year. Do this each year and watch your garden explode with abundance. Now it’s time to get started! But don’t worry about trying to write down everything in this post. I made a free and easy-to-print cheat-sheet with all the information you need to get started with these 11 perennial greens, plus some extra resources. We have Miner’s lettuce growing wild in our yard! Nice! We are lucky to have it growing wild in western WA. It was exported to Europe and is now grown for high end restaurants. Hello and thank you! I’m very happy to hear that you enjoyed the post. Given your climate I think saltbush might grow well there – my area is a bit too wet for it to thrive. Though finding seeds for it can be a challenge. I have some more posts planned on different types of perennial vegetables that you might like. Keep watching – the next (perennial root crops) is currently penciled in for March and I have some more planned after that. Thanks again! Thanks, Daron… good info. Pacific waterleaf is new to me (I’m in PNW) so the botanical name is helpful…Hydrophyllum tenuipes. Also, I’ve struggled to propagate ‘tree collards / kale’ and see from the Amazon website, they ‘will root in warm weather’. They are selling cuttings (not rooted), and now (Feb) may not be the time to try to root them, in northern climates. Hello Nancy and thank you! Waterleaf is a great PNW plant to add to shady areas as an perennial vegetable. It also likes to spread so you can get a fair bit without too much effort. The Project Tree Collards site does have rooted cuttings for sell too. You can get them from their website directly or on Amazon. There is also another site that I was just sent today that also sells cuttings but you are right this may not be the best time of year for those. I’m waiting for our current cold snap to end then I plan to order some of the rooted tree collard plants. I have an area next to my house picked out for them so they can be protected from the winter chill. Hello and thank you very much! I have never tried Japanese knotweed – it is actually illegal to grow in my area. Luckily there are a lot of other perennial vegetables to grow! Do you think you will try any of these 11 on your new off grid site? Love this post! Thanks for sharing it at the Homestead Blog Hop – I chose it for one of the features!